The warm months of summer are always an ideal time to spend camping with family and friends, not to mention prime time to hit the beach. Unfortunately, most of our canine friends don't enjoy the hot weather as much as we do. Flea populations thrive in warmer temperatures and our furry pals are, unfortunately, among their favorite victims. Dog flea infestations can rapidly escalate into a more serious problem and affect everyone (even humans!) in the family. What are Dog Fleas? Are They Different? First... How Do Dogs Actually Get Fleas? What Are The Signs That Your Dog Has Fleas? How To Check Your Dog For Fleas? The dog flea is a type of ectoparasite, which means that it lives and feeds outside of its host. This extremely minute insect latches onto the skin of various mammals, especially dogs. The insect survives by sucking the blood of its host and is often confused with cat fleas. Read Also: How long can fleas live without a host? Here's something you might not know: dog fleas and cat fleas are two entirely different species! However, good luck telling them apart without lab equipment, as the physical differences between the two can only be observed through the lens of a sophisticated microscope. Want to skip all this research and just hire a decent exterminator for your flea problem? Cat fleas, it should be noted, are a much more prevalent species in comparison to dog fleas. These parasites feed on a wide variety of mammals and can also be found on dogs. In fact, most cases of dog flea infestation are due to preexisting infestation of cat fleas. Read Also: How to tell if your cat has fleas? At this point, you're probably wondering how your dog got fleas in the first place, right? After all, you keep your pet clean, you aren't a dirty person yourself, and your home or yard isn't a mess. So, what gives? Our canine friends get fleas in various ways. There's a widely-believed stigma that just because a dog has fleas, it's not very well cared-for. We're here to tell you that this certainly isn't always the case. Canines can easily pick up these irritating parasites through exposure with other animals. Dogs are naturally active in socializing with other pets—especially when you take your canine pal to trips in the park. Other flea-carrying animals that you should watch out for are birds, raccoons, opossums, squirrels, and ferrets. Fleas could also be hiding outside your home just waiting for the right time to hitch onto your pet. They can take temporary refuge on your porch or in your backyard, then strike an invasion on your canine pet at any given opportunity. In some cases, pet owners are the cause of the problem. These bloodthirsty parasites can hitchhike onto your luggage from your last trip and find their way towards your pet dog. A single flea can drink up to 15 times its own body weight in the form of a blood meal! In the worst cases of infestation, fleas can pose a serious threat on their hosts, especially among puppies and old/sickly dogs. Furthermore, flea bites trigger an allergic reaction on their hosts most of the time, which can lead to extreme itching and restlessness. A single adult dog flea can lay between 20 to 50 eggs a day. And while they feed, they produce waste. Flea eggs appear oval in shape and white in color. On the other hand, flea droppings look like tiny black dots. Flea eggs and droppings easily fall on the ground and may like like salt and pepper granules. One way of identifying whether your dog has an existing health problem is by checking its gums. If your dog has white or pale gums, it's a surefire sign that your pet has anemia. This is explained further in the video below. As mentioned earlier, fleas are heavy drinkers. And in larger numbers the parasites are more than capable of making their hosts anemic. This means that your dog's blood could be drained of its supply of hemoglobin...otherwise known as the protein responsible for carrying oxygen through the blood. Without an ample supply of this protein, sufferers of anemia become weak, dizzy, and have trouble breathing. Some dogs are allergic to flea saliva, and the reaction can manifest itself into severe itching with red sores and patches of hair loss. Young pups and older dogs are more vulnerable to developing allergic dermatitis. Normally, patterns of hair loss and allergic reaction on the dog's skin are found in the hind quarters of the dog—either on the back legs or along the tail. Because of the fleas' continuous biting and the possible allergic reaction to the parasite's saliva, dogs are often mistaken to be restless. Someone can also see them scratching and chewing on various areas of their body in an attempt to relieve themselves of the discomfort from the fleas. Fleas sometimes carry the larvae of tapeworms with them. And as your dog tries to find relief by licking and biting on the itchy parts of its body, your canine pal may ingest some of its parasitic invaders along with a couple of tapeworm larvae. As the tapeworm grows inside your pet dog's intestine, it sheds off some of its parts into the waste products. If you see something moving around your pet's feces when cleaning up after your dog, chances are that your canine friend has tapeworms and fleas. ​Checking a dog for fleas requires fast and sharp eyes. Fleas are only about 1-2 mm long and can move away fast thanks to their extraordinary jumping skills. For a quick glance at what fleas actually look like, check out the video below. First, let your dog lie on its back. Carefully brush through the fur in the armpit and groin areas with your fingers. 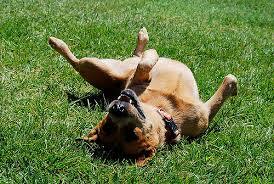 Fleas often flourish on these portions of the dog's body because they serve as perfect, undisturbed hiding spots. 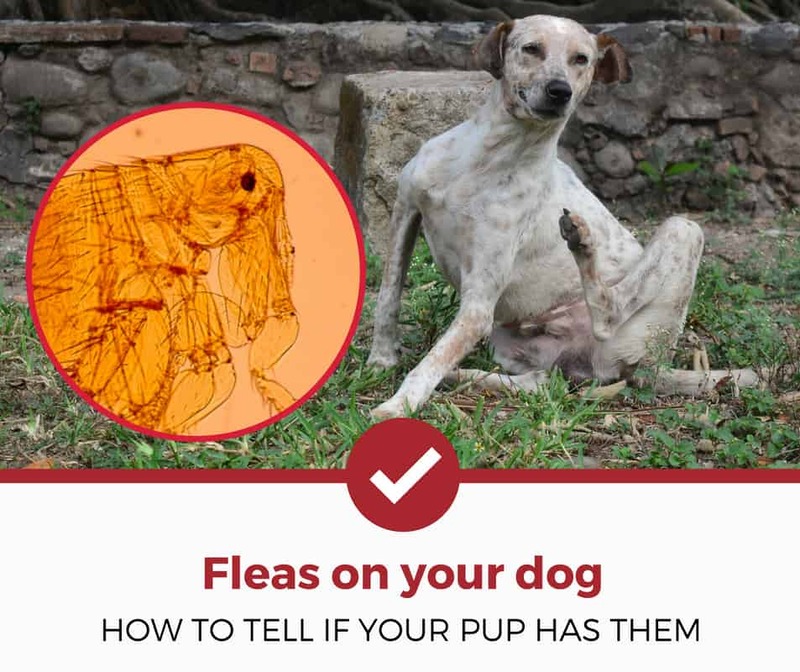 You should also check on your pet's belly and look for fresh flea bite marks. With the help of a flea comb, take your inspection up to the deeper and more hairy areas of your dog. Slowly comb through the hair of your pet one section after the other. Compared to an ordinary comb, a flea comb is equipped with specially-designed teeth that can effectively trap those flat bodied parasites. The flea comb can also help in brushing flea eggs and droppings off your pet. Let's face it—fleas on your pet spell out disaster. Despite their minute size, fleas are capable of wreaking havoc into your pet and family's lives. Furthermore, your dog is helpless to solve this kind of problem on its own. The battle against fleas is a race against time. In order to prevent the problem from escalating into a more troublesome issue, you should be able to act swiftly and decisively. If in case you can't get rid of the stubborn fleas from your pet, it's best to seek professional assistance from your local vet. Curious about other flea related articles? Check out our other detailed guides to help you deal with your pest problems.